What if you could write faster and publish more content? What if your inner critic stopped nagging? 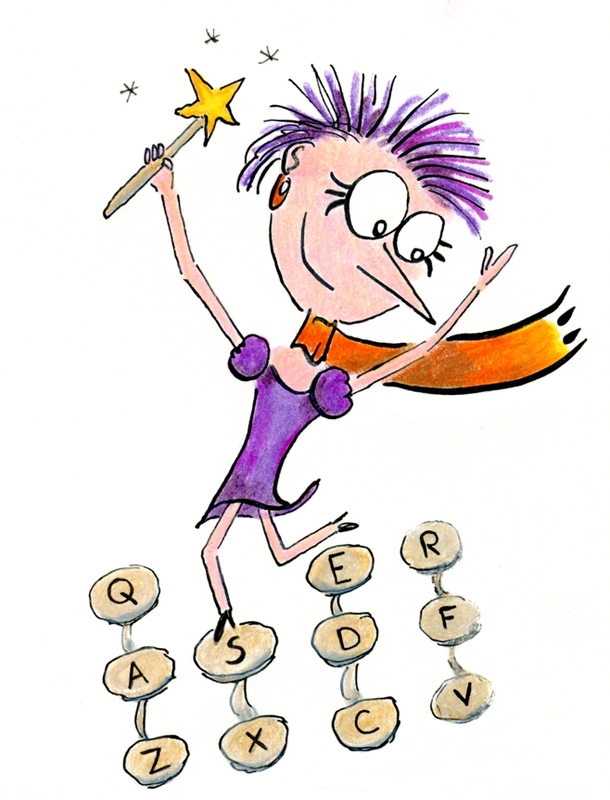 What if writing was more joyful? When I started writing in 2012, writing felt like an excruciating process. I felt slow. I struggled to get my ideas on paper. I was a procrastination champion. I thought writing was just difficult, and that the torturous process was normal. But over time, I learned I was wrong. I learned how to troubleshoot my process and how to work with my inner critic. I learned how to nurture healthy writing habits, so I quit procrastinating (mostly). Above all, I’ve learned to love writing. Discovering the joy of writing helped me become an influential writer. My blog has become both the engine and heart of my business. As a smooth-running engine, my blog posts attract new email subscribers and create interest in my courses. And as the heart of my business, my writing helps me engage readers and make friends. Writing nourishes my soul and helps me earn a living. When you unclog your mind you can focus better, and focus is a superpower that multiplies your productivity. When you form a writing habit, no matter how tiny that habit is, you overcome resistance to writing, and your body of work grows over time. When you learn to troubleshoot your writing process, you get unstuck more quickly and produce good content faster. When your inner critic becomes quieter, you find more joy in writing, and your motivation and confidence grow. Joyful productivity creates a virtuous cycle or upward trend. When writing is more joyful, you feel more inspired, you become more confident, and you write faster. This is how you crush writer’s block, find your voice, and engage your readers with more gusto. This course is based on proven methods—a unique mix from writing advice, psychology, and even sports science. You learn how to experiment and fine-tune your writing process, so you can feel at your creative best. You can apply many of the principles in other areas of your life, too. For instance, establishing a solid writing habit gave me the confidence to form other habits, too, like learning to draw and meditating—activities that felt almost alien to me when I started. And when I learned to work with my inner critic while writing, I became less critical of myself overall. I learned to embrace rather than fight my limitations. When you learn the principles of nurturing a healthy writing habit, you can take better care of yourself in other areas of your life, too. I like how Henneke and Kathy have designed this course because it is not only about writing but also about learning how to be compassionate with oneself. Imagine you want to become a faster runner. You wouldn’t just read exercise plans, would you? If you’re a pro, you run every day, you analyze your performance, and you may talk to a sports psychologist to improve your focus. The same is true for building healthy writing habits. So, Write It, Don’t Fight It is a practical course. You learn in small, incremental steps, and at the end of each lesson, you find recommended activities to implement the advice, and questions to reflect on your writing practices. Finding the course inspiring and fun. Excellent step by step set out – appreciate the download option – with valuable ideas and suggestions on every page. We’re all different, so no one-size-fits-all approach exists. Instead, this is a banquet of strategies and tactics, so you can experiment and select what works for you—whether you should outline or freewrite, whether it’s okay to edit while you write, whether to set an audacious writing goal or whether you’re better off with a ridiculously low target. This course on joyful productivity comes in three parts, in which you learn how to foster a healthy mindset, how to nurture good habits, and how to master your writing process. There are no empty promises, and the hard work that needs to be done is laid out in a simple and clear way. In the first part of this course, you learn how to unclog your mind so your inner critic stops nagging and you can write with more joy. After completing the first part of this course, you understand how to let go of perfectionism, and how to build courage so you can dance with your writing fears. This is the firm foundation that helps you believe in yourself so you can achieve more ambitious writing goals. Since I finished the course I find it easier to silence my inner critic and get more writing done. In the second part of this course, you learn how to nurture healthy writing habits and how to get rid of unproductive habits so you can show up consistently and achieve your writing goals. The activities in the second part of the course help you find focused time to write despite a busy schedule. You learn how to commit to and achieve your writing goals, and how to accelerate your productivity so you can become a more productive writer. My goal in 2018 was to “blog more regularly,” which I was struggling to do. Write It Don’t Fight It came along at just the right time! Since starting the program, I’ve written and published 3 blog posts, a 300% improvement over my track record in the same time frame. In the third part of this course, you learn how to master your writing process so you can sneak around writer’s block and produce good content faster. At the end of the third part of the course, you’ve acquired a toolbox full of tricks and tactics to troubleshoot your writing process so you can beat writer’s block and write faster. In Book 3: The Confident Writer, I like Henneke’s suggestion, “Follow the 90 percent rule.” It’s true that when I take it easy, I not only write faster, but I also get better ideas. (…) When I work at 90 percent (and not 110 percent), it’s easier for me to let go of perfectionism. I am able to focus better on writing instead of stressing about the result. And it frees up a lot of my mental energy. 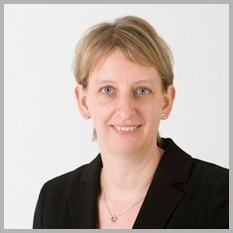 Henneke Duistermaat is the main author of the Write It, Don’t Fight It course. 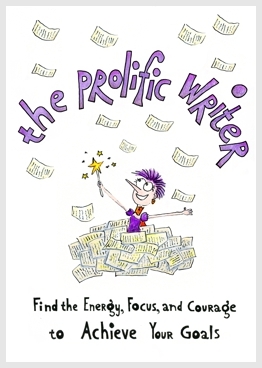 As a writing coach, she has helped writers and non-writers get unstuck and fall in love with writing. As a blogger, she publishes high-quality blog posts on Enchanting Marketing regularly and she has contributed to popular blogs such as Copyblogger, Inc.com, HubSpot, and Crazy Egg. In recent years, Henneke learned how to nurture a joyful mindset and how to become more productive despite chronic pain and fatigue. Henneke dislikes writing a first draft but loves editing. She thrives on steady progress towards her goals. Kathy Keats helped structure the Write It, Don’t Fight It course and contributed her knowledge of sports psychology and peak performance. 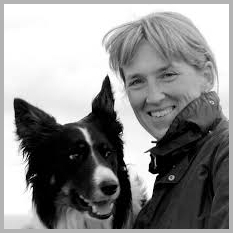 As a former world champion in dog agility, Kathy learned how to stretch her self-belief and perform at her best. As a high-performance coach, she now helps clients unclog their mind, so they can reach their potential in sports and in life. Kathy lives on a farm, and in recent years, she has learned how to juggle farm and online business responsibilities, and how to gain focus and nurture a writing habit despite regular interruptions. Kathy loves freewriting, resists outlining, and loves to set herself big goals to challenge herself to write more. 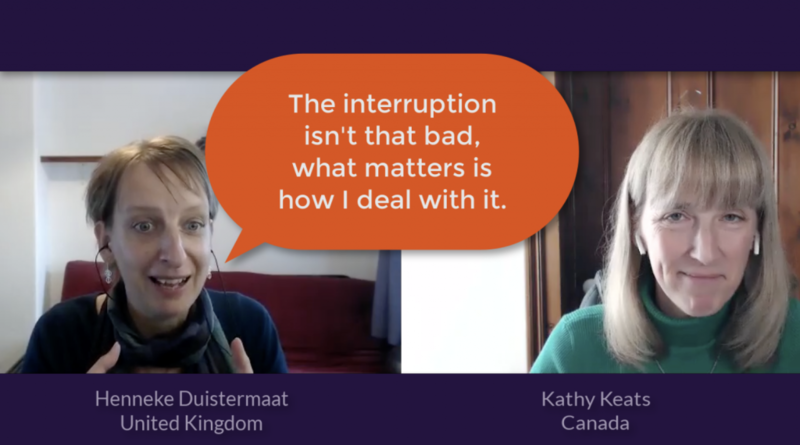 In this course, Kathy and Henneke share what they’ve learned from their coaching practices, supplemented with solid academic research and their personal writing experiences. [T]hese women really know their stuff. They bring a wealth of personal experience, compassion, generosity and a solid knowledge of the literature on habit formation and other topics that support a solid writing habit. Write It, Don’t Fight It is a practical course where you learn how to integrate the principles of joyful productivity into your writing practice. The course is self-paced so you can work in your own time and at a learning pace that works for you. All material is available as downloadable videos and PDF ebooks, and as an online lesson plan to keep track of your progress. This is a self-paced course—you’ll get lifetime access, so you can dip back into the course at any time to reinforce your learning and pick up new tips and tricks. At a steady pace, it’ll take you around 6 weeks to work through the material and complete the activities. But you can work faster or slow down, as suits you. Going through all the assignments had an effect on me that goes way beyond writing faster (…) I overcame some issues and beliefs that had been holding me back for years. When I look at the list of my writing hurdles and fears that I wrote at the beginning of the course, I can say that many of them shrank or disappeared. Want to write more, too? 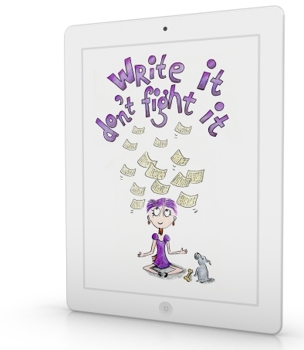 The Write It, Don’t Fight It course is for you if you’d like to write more but something is holding you back—whether that’s perfectionism, lack of confidence, writer’s block, procrastination, an overwhelming to-do list, or a rickety writing process. This course is most useful if you want to write a blog, book, enewsletters, or other content for your business. This course teaches you the principles of joyful productivity and how to master your writing process, so you can become a more prolific and joyful writer. Your enrollment is processed by Teachable, Inc., and Sales Tax or VAT may apply. Anyone who has tried to write knows it's tough. Henneke & Kathy understand. They are both seasoned writers. Their course is a tool box full of processes that deal with the demons of procrastination, perfection, crappy first drafts, inner fears, and much more. Write it Don't Fight it is a road map that will benefit everyone who has that endless yearning to write. It becomes a habit that can last a life time. Thank you both! A very well built up course where the three parts reinforce each other: a healthy mindset, productive habits and mastery of the writing process. I finally managed to develop a writing routine. And I found ways to keep going when I feel stuck. The Pomodoro technique: to work in 25 minute-slots helps me to keep up my energy. I learned most from reading about Henneke's own ups and downs and how she dealt with them. I’ve developed a habit of writing at a specific time. Far easier than trying ‘to fit in the time to write’ which never seemed to work. Probably influence from my inner critic, right? I chose to download the worksheets. Paper, Pencil and Ponder... Interesting to me was reprinting and completing some a 2nd time. Comparing the responses, clearly demonstrated the progress I have made. My confidence and joy in writing grows daily. Henneke has responded to every email - encouragement, suggestions, appreciation with genuine comments, not canned responses - that’s impressive. 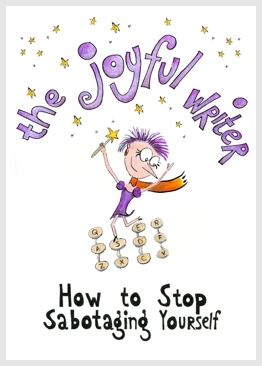 Write It, Don’t Fight It - for Joyful Writing & a Joyful Life. 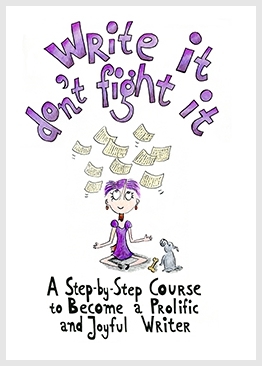 "Write it, don't fight it" became my go-to bible whenever I feel stuck on my writing process. 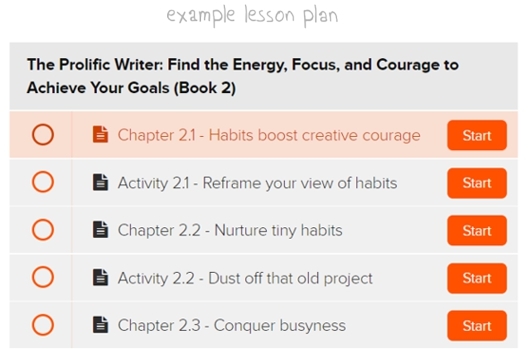 You'll find guidance on how to create healthy writing habits. And, practical tips on how to outline, edit and revise your texts. A fabulous foundation to foster writing flow! I particularly liked how the three pillars interact and support each other in a very pragmatic way – I can keep the big picture in mind while focusing on small steps. Having both online and offline options is great, and the accompanying emails add a motivational boost. I’d recommend this course to anyone who’s looking for inspirational plus practical writing guidance. Thank you so much for creating this course, it’s having such a great impact on me. The way in which you integrated mindset, habits and process is brilliant. And the course goes way beyond writing because as you said in the sales page, it also works for other areas of life. I now have the tools to deal with my fears and my inner critic. I can change my narrative and work around my perfectionism. The tools to master the writing process are helping me write and get unstuck faster. As a bonus, I'm being more patient and compassionate with myself! I'm in the middle of the course, and already this is one of my favorite purchases. I love how Henneke structured the course with essential building blocks that result in prolific outcome. Writing requires craftsmanship. This course helped me evaluate my writing process and use the right tactics to pull myself out of a rut and get optimum results. 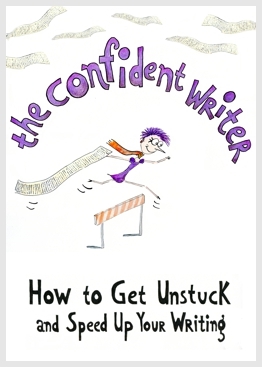 In Book 3: The Confident Writer, I like Henneke’s suggestion, “Follow the 90 percent rule.” It’s true that when I take it easy, I not only write faster, but I also get better ideas. 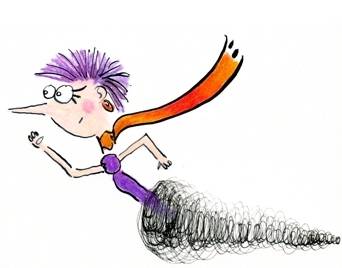 Right through this course, Henneke emphasizes that if you want to write fast, you need to silence your inner critic. Henneke says slow down, take longer breaks, and write a shorter to-do list. When I apply this strategy, the result is I feel more relaxed and get more done. I find that when I work at 90 percent (and not 110 percent), it’s easier for me to let go of perfectionism. I am able to focus better on writing instead of stressing about the result. And it frees up a lot of my mental energy. I've enjoyed this course very much. I have found particularly useful the first book where Henneke and Kathy give you tricks to deal with your inner critic. This has been always my main problem when wanting to become a full-time writer, I just couldn't manage the negative thoughts in my head that stopped me too often from achieving what I wanted. Since I finished the course I find it easier to silence my inner critic and get more writing done. I like how Henneke and Kathy have designed this course because it is not only about writing but also about learning how to be compassionate with oneself. 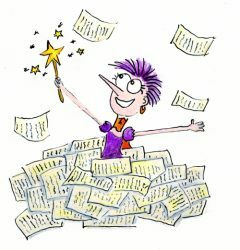 I've taken a number of writing courses but they usually just added to my overwhelm. This one was different. I love that the course gives you practical tips without being too prescriptive. I also appreciate that each lesson is followed by an activity that helps you implement what you have learned right away. Going through all the assignments had an effect on me that goes way beyond writing faster, which was my goal when joining the course -- not that I believed it would work in my case, but I gave it a shot and it did work. What's more, I overcame some issues and beliefs that had been holding me back for years. When I look at the list of my writing hurdles and fears that I wrote at the beginning of the course, I can say that many of them shrank or disappeared. Some of them will always be with me, but they don't make me feel so powerless anymore. Finally, the live Q&As, the ability to take the whole course offline, and the illustrations make the course a unique and enjoyable experience. -The live Q & A sessions with Henneke and Kathy yielded valuable insights on building confidence, developing a regular writing practice and more. I could go on but let me summarize by saying these woman really know their stuff. They bring a wealth of personal experience, compassion, generosity and a solid knowledge of the literature on habit formation and other topics that support a solid writing habit. I strongly recommend it. I've loved this course, as all of Henneke's courses. They always exceed my expectations. In this one, there is a ton of information arranged in a logical pattern to understand procastination and implement productivity tips to boost results as a writer (but it could be useful in any other area). It's a step by step way to see what could be wrong in our writing process and how to fix it. And it's a nice plus to have the live Q&A's to deepen the understanding of it all.